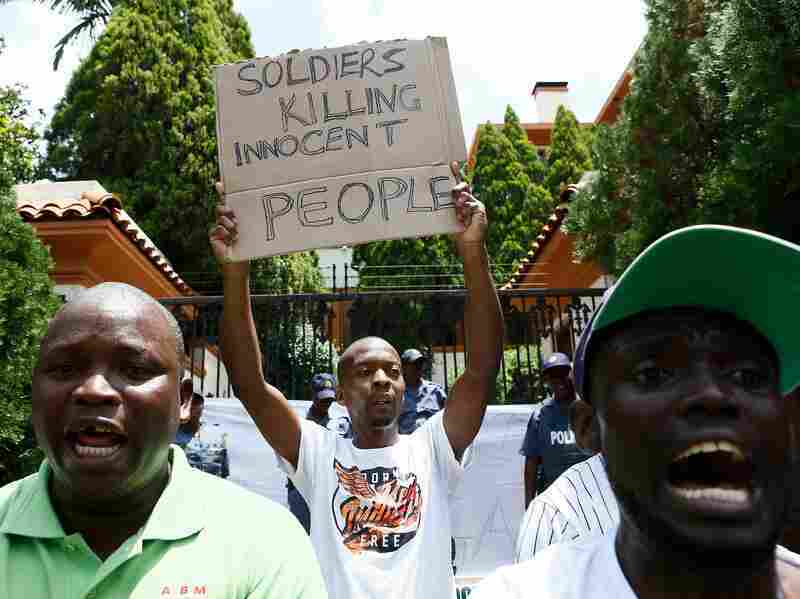 Zimbabwean Forces Accused Of 'Systematic Torture' After Protests Over Fuel Prices The Zimbabwe Human Rights Commission says the Zimbabwe army severely beat protesters upset over a spike in fuel prices. President Emmerson Mnangagwa condemned what he called violence on both sides. 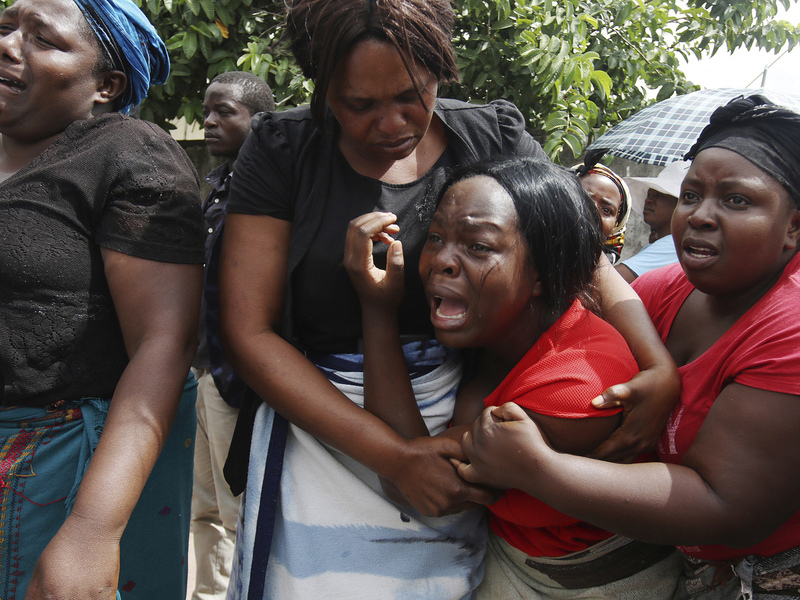 A family member of Kelvin Tinashe Choto reacts, during his funeral in Chitungwiza, about 30 kilometres south east of the capital, Harare, Zimbabwe on Saturday. The 22-year-old was shot in the head, one of at least a dozen people killed in a violent crackdown by security after protests over high fuel prices. Witnesses told the ZHRC that security forces from the Zimbabwe National Army and Zimbabwe Republic Police went into houses at night, asked the males to go outside and lie on the ground, and then beat them. Forces "would also target men and boys who live in houses that are near areas where looting took place or where barricades were set up and just make dragnet arrests without investigating," the report said. Boys as young as 11 years old were allegedly beaten. "Torture was perpetrated through beating the men with baton sticks on their backs while they lay on the ground," the ZHRC found. In some cases, troops specifically targeted people sympathetic to the opposition party, Movement for Democratic Change, including members of parliament, the commission said. Responding to the report, a senior official told journalists that "when things get out of hand, a little firmness is needed," the BBC reported. In a statement, Mnangagwa condemned the violence by the country's security forces. "Violence or misconduct by our security forces is unacceptable and a betrayal of the new Zimbabwe," he said on Twitter. "Chaos and insubordination will not be tolerated. Misconduct will be investigated. If required, heads will roll." A protester holds a placard during a demonstration of Zimbabwean citizens outside the Zimbabwean Embassy in Pretoria following the announcement of a petrol price hike in Zimbabwe and the recent shut down of mobile phone networks and internet services. Mnangagwa also defended his effort to stabilize the country's fuel supply by increasing prices, and criticized the violent protests that ensued. "Everyone has the right to protest, but this was not a peaceful protest," he said. "Wanton violence and cynical destruction; looting police stations, stealing guns and uniforms; incitement and threats of violence. This is not the Zimbabwean way." The torture reported by the ZHRC is an escalation of the type of repression the country experienced during the recent election, NPR's East Africa Correspondent Eyder Peralta reports. "Zimbabwe has a long record of significant human rights abuses," he says. "Security agents have long acted with impunity to silence and sideline dissenters." Although the ZHRC is an independent government agency mandated by the constitution, it doesn't have the power to dole out punishment, Peralta says. "So little action is likely to come out of this report." Last year, the government put together another independent government commission to look at the killing of six people following the elections last year. That commission found the military used excess force, but no one has been punished, Peralta reports. Activists associated with the Zimbabwe Congress of Trade Unions, which called for a general strike last week, are facing the most harsh government crackdown following protests, Peralta reports. Its secretary general, Japhet Moyo, is facing charges of "attempting to overthrow" a constitutionally elected government, the ZCTU says.